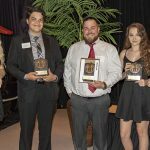 The Ridge League of Cities awards two $1,000.00 scholarships to municipal officials to attend the annual Florida League of Cities Conference in August. This opportunity is open to municipalities with a population of 9,000 or less within the RLC. The goal of the scholarship is to allow an elected official who has not attended the conference the opportunity to participate. © Ridge League of Cities - BrandAid author.